Portugal is located on the Iberian Peninsula in southwest Europe, bordering Spain to the north and east. The westernmost nation of mainland Europe, it also encompasses the Azores, Cape Verde and Madeira Island groups in the Atlantic Ocean. Aged only 900 years, Portugal is the oldest country on the continent with the same land borders and has played an important role in world history. Leading the way for European exploration during the 15th Century, the Portuguese discovered their Atlantic archipelagos, established important sea routes to India and colonised areas in Africa, South America, Asia and Oceania during this so called ‘Age of Discovery’. Given its rich history, Portugal is unsurprisingly filled with fascinating monuments, ruins and clifftop castles, captivating visitors across the whole country. In fact, there are 21 UNESCO World Heritage Sites to choose from including the Convent of Christ in Tomar, the beautiful Monastery of the Hieronymites and the Tower of Belem, a district within the capital city of Lisbon. Overall, the finest examples of Portuguese historical architecture can be found in Sintra, Lisbon and Porto, characterised by idyllic medieval town centres and Romanic churches. The 800km of mainland coastline is adorned with golden beaches, world class surf breaks and rolling green hills, but equally stunning and more remote areas can be found on the numerous Atlantic islands. The Azores, with their emerald calderas and deep blue seas are havens for hikers and whale watchers; Madeira is famed for its namesake wine, pleasant year-round climate and lively port towns; while Cape Verde, also volcanic, lies 500km west of Senegal and is known for its Creole Portuguese-African culture and sublime shorelines. A land of multiple of island groups, ferries to Portugal span across the Atlantic Ocean. The Azores are interlinked by a series of routes with varying journey times, owing to the sporadic locations of the eight, lush islands. Ferries to Madeira connect Porto Santo with the namesake island, and with numerous sailings every week, it’s a great way of hopping between two of Portugal’s warmest spots. Ferries in Cape Verde primarily depart from the travel hub of Praia, on the southern coast of Santiago Island, offering a network of routes to and from the outlying islets. 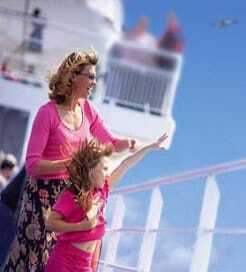 For more information, please visit our Ferries from Madeira Islands to Portugal page.